Epson Expression Home XP-422 All-in-One Printer with WiFi Direct – This is an extremely efficient, compact yet affordable all-in-one printer perfect for those who do not have a lot of room but still need cost effective printing. 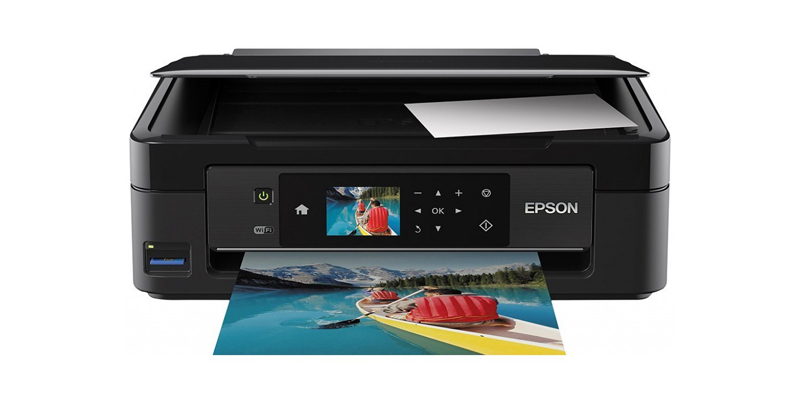 The Epson Expression Home XP-422 features Wi-Fi Direct, so you can print and scan from anywhere. Plus it is easy to set up and control thanks to the intuitive 6.4cm LCD screen with touch panel. printed text is crisp and clear text, while glossy photos look great and are almost lab quality. This is a printer, scanner and copier in one so a great cost effective home printing solution with Wi-Fi connectivity. The automatic Wi-Fi set-up is awesome and makes configuring laptops and computers really easy. The XP-422 automatically finds the relevant network connection settings in order to configure itself and it comes with Epson Connect which includes Epson iPrint for easy wireless printing from Apple iPhones and iPads. AirPrint and Google Cloud Print are also supported and there is a memory card slot for photo printing and copying without a computer or smartphone. Canon PIXMA MG3250 All-in-One Colour Printer – this Wi-Fi printer also features copy and scan functions plus Apple AirPrint support. The Canon PIXMA MG3250 offers high resolution photo printing at 4800dpi with a handy Auto Duplex Print feature for automatic double sided printing. Home printing from PC, laptop or mobile device is easy as is paper loading and ink replacement using the extra capacity XL FINE cartridges. Brother HL3140CW A4 Colour Laser Wireless Printer – this printer offers high speeds of up to 18 ppm mono/colour printing with a large 250 sheet paper capacity for big printing jobs. The secure 802.11n wireless network connection provides effortless connectivity and allows you to print direct from your mobile phone (compatible with Apple iOS, Android, Windows Phone and Blackberry devices). This printer is ideal for small or home offices, with up to 2,400 x 600 dpi print resolution and Apple AirPrint and Google Cloud Print for ultimate functionality.